It's hard to describe that nostalgic feeling you get when you see something from your past. Time has a way of softening perception. 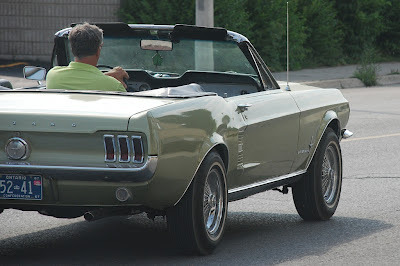 We forget what we hated about whatever it was - in this case, the lousy fuel economy, non-existent safety features and abysmal reliability - and instead revel in the relatively simple joy of tooling slowly down a small-ish-town street with the top down. While words may fail us, that feeling deep down in our soul makes it clear: it's nice to look back every once in a while. For the next week, I hope we'll share some retro pictures that evoke a similarly soft-focus view of the past. If it's from the past and it makes you feel good, we want to see it. Your turn: Post a retro-themed picture on your blog, then leave a comment here letting folks know where to find it. Visit other participants to share the photographic joy, and feel free to submit as many times as you wish - serial participation is highly encouraged. It's all about sharing and learning. We call it Thematic Photographic, and there's more background on it here. You will get a kick out of the second example I posted! Carmi, you have very good timing once again. I captured my subject for this post just yesterday afternoon when I had to make an emergency trip to my grandson's school. I had to take a taxi to get here. Makes me sing little deuce coupe for some reason... lol... What a nice ride! This is my kind of PONY! I've always been a fan of this style! Cool theme Carmi-but gee I can't believe I need more RETRO in my files! But here's a quicky I squeezed out...gott go for more though! I have my retro pics up. You definitely caught my attention with that '67 Mustang. Beautiful car, great shot of it! Here's my "retro" pictures (no cars in it, maybe later this week). Gotta head to bed now, but I'm looking forward to tomorrow evening when I get to look at everyone else's retro shots. Shaped by nature. Then wiped away. Where golf begins. And ends.